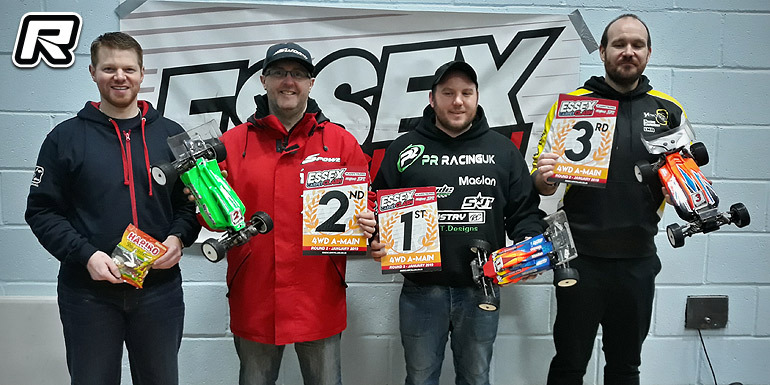 After the huge success of the first round at the end of December the Essex Carpet Clash returned to Hornchurch, Essex, for round 2 of what’s proving to be a very popular new off road series, with yet again a full entry for 4WD and 2WD. After listening to the drivers feed back from the previous round, a few small changes were made to both the pitting and more importantly the track. Additional jumps were added for this round and strategically positioned to give a fun and more driver-friendly track. The addition of a cross over jump proved a real favourite with the racers and looked great for the spectators. There was a slight change in the race format for this round giving the drivers even more value for money. Practice, four round by round qualifying runs and three finals for all. Ed Kerry was on form in 4WD and took the pole position with three fastest times out of the four rounds. Pushing him all the way was Kevin Brunsden and Jon Hazelwood which rounded out the top 3. 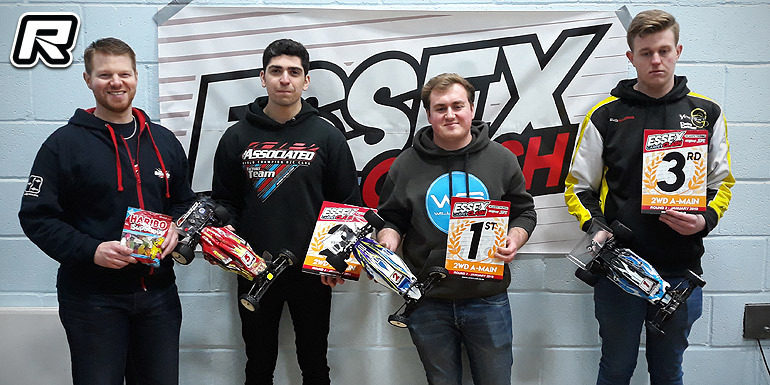 Steven Biscoe and Stuart Joyce were also proving two quick drivers both taking 2nd places finishes in rounds so a great set of finals were on the cards. The top 5 places in 2WD were exceptionally close being split by three points, with the top 3 all joint on two points all taking round wins throughout the day, so it came down to the fastest times to decide the top 3 who were, in 1st place and taking pole Paul Crompton, followed by Kyle Moon and Ellis Stafford. 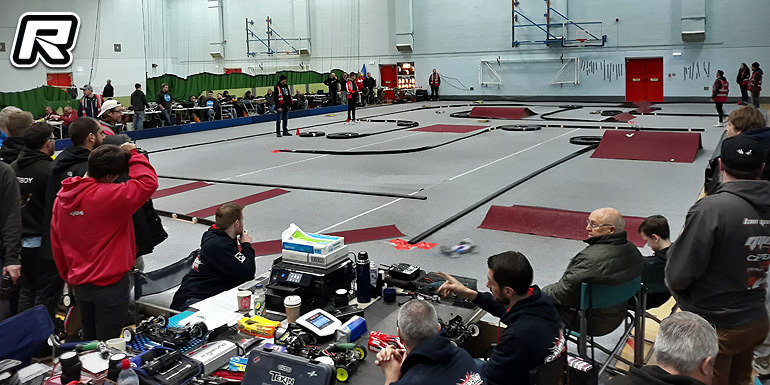 Leg 1 of the 4WD finals was a flag to flag win for Ed with Kevin keeping in touch for the whole race, Mark Lewis had a great drive from 5th on the grid holding off Jody Howard to pick up 3rd place. Leg 2 and this time it was Kevin who got the better run to take the win. 2nd was Jon and 3rd Ed, this being one of the closest finals seen all day with the three drivers split by two seconds. Leg 3 and Ed got the job done being six seconds up the road from Mark and Jon taking 3rd. A great set of finals for Mark who was joint on points for 3rd place overall with Jon so picked up a fine 4th place. Leg 1 of 2WD and Kyle Moon had a great start to the three-legged finals picking up the 1st win with a huge eight second lead over 2nd place William Venables. Paul Crompton picked up 3rd and showed his pace as he didn’t cross the finish line. Leg 2 and another dominant win for Kyle but this time William was always there ready to take the win with the two separated by a few seconds. Joe Howson had a great run and picked up 3rd place. Leg 3 and a clean sweep for Kyle making it three from three to come out on top as the overall winner but was pushed all the way by Paul both less than a second apart crossing the finish line both in front of William. 4th place overall Ellis Stafford and 5th place overall Joe Howson were joint on points showing how close the days racing had been. Round 3 of the Essex Carpet Clash will be held on the 17th of February.